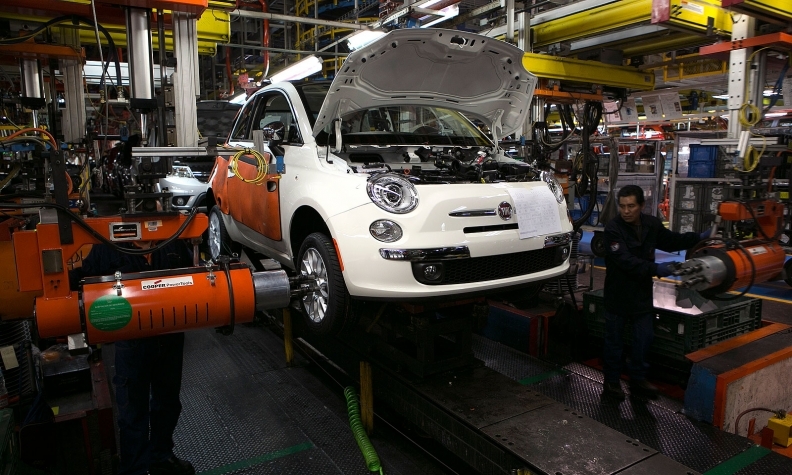 Wheels are installed on a Fiat 500 at Fiat Chrysler's assembly plant in Toluca, Mexico, in Nov. 2013. Automakers have expanded production in Mexico to capitalize on lower labor costs that bolster the profitability of vehicles sold in the U.S. -- but the practice may be upended by President-elect Donald Trump's vow to revisit the North American Free Trade Agreement. About 40% of the parts in every Mexican-made car come from the U.S. The U.S. is the biggest outside auto-parts supplier to Mexico. Mexico and Canada together buy 77% of U.S. parts exports; the next three customers account for 6%. While Mexican auto production has risen to 3.4 million vehicles a year from about 1 million since NAFTA, production in the U.S. and Canada has remained stable. Mexico was the world's 7th-largest auto producer in 2015, and No. 6 in auto parts, while the U.S. was No. 2 for both, behind China. At a conference in Mexico City last week, industry leaders representing automakers, truckmakers, suppliers and retailers in Mexico defended NAFTA as essential to the U.S. economy. MEXICO CITY -- Mexican auto industry officials are lining up their arguments to defend the North American Free Trade Agreement against President-elect Donald Trump's campaign promise to renegotiate the pact or throw it out altogether. The officials, armed with data and economic studies, have boiled their arguments down to a simple message: The United States and Canada are much better off with the 1994 trade deal than without it. In an era of global competition, they say, Mexico complements the United States and Canada more than it competes with them. Although nervous about eventual talks between Mexico and the Trump administration, the industry leaders say they have a winning argument since the pact has woven trilateral ties that cannot be torn apart without major damage to the North American auto industry. Mexico's warning may appeal to Trump's instincts as a businessman who knows his way around the world, and as a politician who wants to deliver on his promise to protect American manufacturing jobs. "Mr. Trump has said that he is going to be the president that promotes jobs, and in order to have jobs you have to be competitive," Eduardo Solis, president of the Mexican Automotive Industry Association, said last week at an industry gathering here. "The North American region has to be analyzed vs. the other regions of the world, not Mexico vs. the United States." Solis, a former government trade negotiator, warns against assuming the worst-case scenario from Trump. "The relationship is so strong among the industries in the three countries," he said. "We have to use that as a starting point and not what happens if the United States leaves NAFTA." 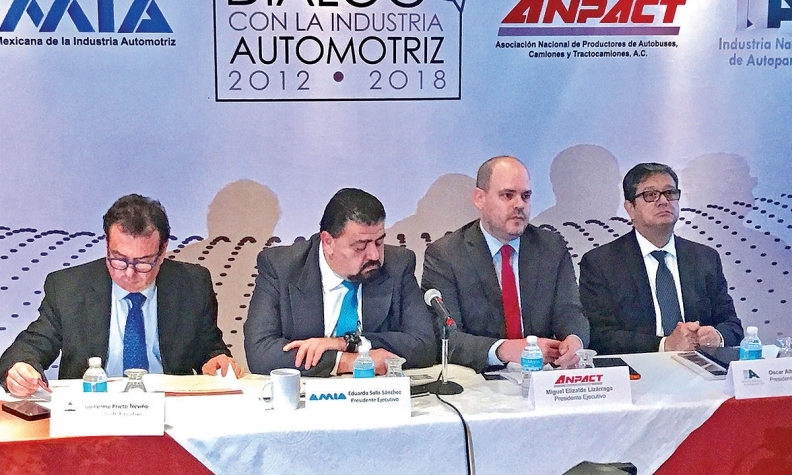 The Automotive Parts Manufacturing Association (AMPA) estimates that 25 Canadian auto parts makers operate upward of 50 facilities in the state of Querétaro alone. Just last month, Gov. Francisco Domínguez Servién from the state of Querétaro met Premier Kathleen Wynne and APMA President Flavio Volpe during a swing through Ontario. Oscar Albin, president of Mexico's National Auto Parts Manufacturing Association, said all auto producing regions of the world rely on low-wage countries. Mexico has a strong argument to take to Trump: that the United States would be left behind without Mexico since Asian and European auto producers aren't going to give up their low-wage production bases in Mexico and around the world. "For the United States and Canada to be able to produce competitive automobiles and to continue exporting them and consuming them internally, they have us. We are mutually necessary," said Albin. "I think that in the end we are going to be able to make that understood." Both Solis and Albin said that no automakers or parts producers have changed their investment or production plans as a result of Trump winning the White House. One industry leader, who asked not to be named because of the sensitivity of the subject, said Trump's deal last week with Carrier Corp. was telling. The air-conditioning and heating company agreed to keep 1,000 workers at an Indiana plant rather than send that work to Monterrey, Mexico. On the surface, this person said, the story sounds like Trump stopping Carrier in its tracks. In fact, Carrier will still be moving hundreds of jobs to Mexico from that plant and another one, showing some give and take in the negotiations and offering hope to industry officials that manufacturing investments in Mexico won't be choked off.